Hi friends! Are you ready to ring in the new year tonight? I can’t believe tomorrow begins 2016! I will be spending the day taking down Christmas around here, how about you? We are going to a kid friendly party this evening at a friends house, and it should be a fun time. I hope you are able to ring in the new year with someone you love tonight! Today, I want to share our new light in our master bathroom. I am so excited today to show you this change! I have been picturing a light hanging over our bathtub in my mind since we moved into the house. And we finally have one. And bonus! It comes with a sweet story, so you have to promise to read the post today, and not just look at the pictures, mmmkay? I recently painted this room, and hung the bins as shelves, and you can start by reading about that transformation here if you would like. Let me just start by saying that I loooooove this new light! 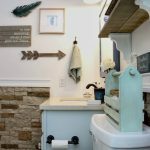 Just editing the pictures for this post made me happy because I love this change in our master bathroom. It feels so much more like our home now. I actually had purchased an antique wicker lampshade a couple of years ago, and was planning on a DIY’ing a hanging pendant for this exact spot, but I had not got around to doing it yet, when I was contacted by Peggy, from a website called Parrot Uncle. She offered to send me a free light in exchange for me writing a review on my blog. I do get offers like this from time to time, and it is definitely a perk of blogging! I always peruse the website and decide if the products are a fit for our home or not before saying yes or no. Well, when I started looking around at the lights on this website, I got really excited because they had so much that I loved! This particular light is called the Rustic Style Hemp Cord Basket Shade Pendant Light. And when I saw it, I knew it would be perfect in our master bath. I love the texture it brings to the room. It is exactly the look I was going for. I photographed it both with and without the light turned on so you could see what it looks like both ways. Now comes the sweet part of the story. In order to hang this light, we had to remove the recessed light and prepare it to hang a pendant light. At first, I thought my husband could do this. After all, he had gotten his feet wet by changing our outdoor lights last summer, and then he changed the light over our master bath sink in the fall. So, we figured this would be the same type of thing, just in the ceiling. And you guys, he gave it the old college try, really he did. But the project proved to be too much for his skill level. He finally admitted that he was at a loss. Afterall, he has a meteorology degree. And he doesn’t know a lot about being an electrician. But if you need to know what the weather is going to be, he’s your man, wink wink! So I set out to hire an electrician to do this job, and a couple of other jobs that have been sitting on the backburner that require some electrical know-how. How does one go about hiring an electrician? Well, you post in your Facebook status that you need to hire an electrician, of course! So that is exactly what I did. I put a status out asking if any of my FB peeps knew an electrician who might be interested in the job. And I got one response, one, people! But, as it turns out, that one single response I got was all I needed. It was from my FB friend Kathy, who lives in South Carolina. Now, let me tell you about Kathy and her husband. It just so happens that I graduated with both Kathy and her husband, Brian. But we never really hung out in the same crowd, if you know what I mean. We were never enemies, by any stretch, we were just acquaintances. We knew of each other. But we never truly got to know each other. Make sense? Well, fast forward many years after graduation, and Facebook came along. I became Facebook friends with Kathy (Brian is not on Facebook, get with the program, Brian!). Well as it turns out, I got to know more about Kathy through Facebook than I really knew back in high school. And then a few years ago, when I started my blog, she started reading it. And then when I joined Instagram, she and I began following each other there too. And at that point, I noticed something about Kathy. I noticed that she was so supportive of me and my blogging efforts. she always “likes” things that I post about, and from time to time she has made nice comments as well, we have even exchanged a few private messages over the years. I started to realize what a sweet person Kathy is. A couple of years ago, she went through breast cancer, and I followed along, and prayed many prayers for her, and through the Glory of God, she is now a breast cancer survivor! So, back to the story- I posted a status looking for an electrcian for hire. And wouldn’t you know, my Facebook friend Kathy, was the only person who responded. she told me that her husband, Brian, was going to be in town the following week, and he would be happy to come over and take a look at the work I needed done. So we started exchanging private messages, and I described the work I needed done, and tried to discuss prices with her. But all she said was that he couldn’t make any promises that he could do every single thing, but that he would take a look, and that he would give me a good price. So we made a date and time for him to come by. So one weeknight between Thanksgiving and Christmas, Brian came by. I don’t think I had seen him since high school! But we had a good time chatting and catching up on each others lives since high school, an I showed him the three projects I had. He took a good look at each one, and he immediately told me that one of them was more than he would be able to get into that evening. That project happens to be installing a light over our downstairs bathroom sink, where no light currently exists. He said of course, it can be done, but it would take a longer time than he had that evening. So, I showed him the other two projects, and he said that he had time to do one of the two, so I could choose which was most important to me. One of the projects was this light, and the other was installing a new light in our ining room, and centering it over our table. I chose to have him install the light over our bathtub, because I already knew that LC was not able to do this on his own. And we discussed the dining room light, and he talked to LC about it, and we are confident this will be a project that he can do himself. So, Brian, got to work on installing this light in the bathroom for us. It took him about two hours. And I hung out in the master bedroom and kept him company while he worked. I tried not intrude upon him, but I straightened up my room and sat on my bed and chatted with him, and came whenever he needed something. And a coupld of hours later, I had this beauty hanging over my bathtub! I was so excited! And I fell in love with it immediately. As he was packing up his tools to leave, I asked him wht I owed him, fully expecting to give him at least between $100-200, and he said I owed him nothing! You guys, I couldn’t believe it! All he wanted was a hug! Well, that was easy, hugs all around for Brian that evening! We are just so thankful for his help. After he left, and I sat in my bathroom admiring my new lovely light, I was very struck by the kindness Brian showed us that night. And by the kindness Kathy shows me all of the time. Neither of them had a single reason for wanting to help us out. But Brian helped us anyway. And I started thinking about all of the bad things happening in our world nowadays. And I smiled, because it is moments like that when I am sure that good will always outweigh evil. This was such a gift from Brian and Kathy. And it renewed my faith in humanity. And we all need that sometimes, don’t we? So Kathy, if you are reading this, have Brian read it to, and I hope you both know how thankful we are for your kindness and help on making this project a reality for us. We simply can’t thank you guys enough! And I promise you both one thing. That is that I will pay it forward. I will spend at least two-three hours of my time at some point helping someone else out with something that they need. And this kind act I will do will be done with both of you in mind. And all I will ask for in return is that the person I help will also pay it forward. And if any of you out there reading this have someone who does something nice for you, I hope this post today will inspire you to pay it forward as well, because it is things like that that really matter in life. And for those of you who are curious, here is a look at what this area looked like before the new light. Just a simple recessed light in the ceiling. Which was fine. I just wanted something that would give this space some character. And this light certainly does that! It also brings the light down to a lower level, which makes it seems more quaint and cozy while I am taking a bath. Because I love my bath time! I am definitely a bath person, and I take several per week. And this light makes my bath so much more enjoyable! If you are in the market for a new lights, do go and check out the Parrot Uncle hanging lights. Their selection of vintage industrial light fixtures does not disappoint! Honestly, I woudl be surprised if you don’t see something you like. I could literally change out every fixture in my house with the lighting that they sell. I’m not kidding. At the bottom of this post, I have added in a few of my favorites for you to see. And here are a couple of shots of this space as reflected in my mirror. After we get all of our Christmas decor packed away, and the house cleaned up, I plan to start working on this room again. I still have to paint and tile the shower area, and add a tile backsplash on this wall where the mirror is, plus frame out the mirror, and paint the door. And then I can finally call this room done! As promised, her are a few lights that Parrot Uncle carries that I just love. What do you think of my new hanging light? I am very happy with it, and I am still loving the color we chose to paint this room. I hope you will stick around to see this room all finished! I am off to finish up some work I am doing on our kitchen island, and then ring in the new year later tonight. Happy New Year to each and every one of you, and May 2016 bring you much love, health, and happiness, CHEERS!